1. Boil the diced potatoes for 10 minutes until tender, drain and mash with the crème fraîche and season. Meanwhile, poach the salmon fillets for 7-8 minutes in a pan of water, then remove and discard all but 1 tbsp of the liquid. Add the watercress, rocket & spinach to the pan, and cook until just wilted then stir into the mash. 2. 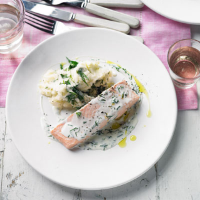 Place the salmon on a plate, heat the remaining crème fraîche with the chopped dill and spoon over the salmon. Serve with freshly steamed green beans and mange tout. This recipe was first published in March 2011.